Daith piercings are a lovely alternative to helix or tragus piercings with pretty much the same healing process. Daith piercings pass through the central fold of ear cartilage, in front of the ear opening. 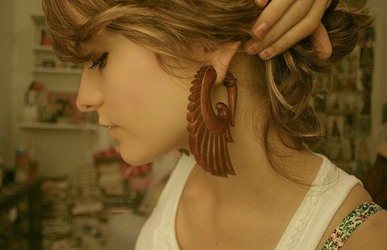 They are usually pierced as close to the ear opening as possible, although other placements are possible. The name “daith” comes from the Hebrew word for knowledge, chosen by a student of Hebrew who was the first person to get this piercing. You can wear a circular barbell, curved barbell or BCR in your daith piercing – depending on how much space there is in that part of your ear. 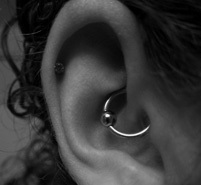 Daith piercings usually heal in 6 to 18 weeks and should be kept clean and dry. You should clean your piercing twice daily with saline solution and avoid submerging it in water. Make sure that your hair does not become tangled in the jewellery and try not to fiddle with it too much. As with any piercing, it is important to keep an eye on your daith for any changes or signs of infection. Common signs of infection are persistent soreness, redness, swelling or if the skin feels hot. If you experience any of these symptoms please consult a piercer immediately. 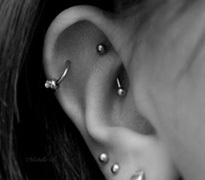 Because this is a cartilage piercing, special care must be taken in case of an infection. If untreated, infection can become trapped in between the layers of cartilage and cause permanent damage to it. Fortunately most piercing infections can be avoided with proper care, but is it important to be aware of the risks. Once healed, your daith piercing will require very little care – simply clean with saline as needed. This entry was posted in Body Piercing Aftercare, Body Piercing Education, Ear Piercings and tagged Body Piercing Care, Cartilage Piercing, Cartilage Piercings, Daith Piercing Aftercare, Daith Piercings, ear cartilage piercing, Ear Cartilage Piercing Aftercare, ear piercing, Ear Piercing Aftercare, How To Care For Body Piercings, Piercing Aftercare on June 25, 2013 by Piercing Guru. 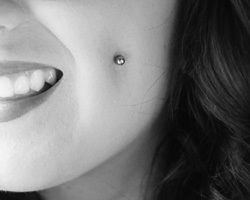 Elegant and easy to heal, monroe piercings are a popular choice. Monroe piercings are placed to the side of the top lip and can be pierced on either side. They are named after Marilyn Monroe’s beauty spot and can also be called madonna piercings, after the singer’s similar beauty spot. Although both men and women sport monroe piercings, they are more popular with women, probably due to the association with Marilyn and Madonna. Monroe piercings are similar to bottom lip piercings in terms of their healing and care. You can wear a labret stud in this piercing and it pierced at either 1.6mm or 1.2mm. As with all lip piercings, monroe piercings do carry a risk of oral damage, but this can be greatly reduced by your choice of jewellery. Monroe piercings heal fairly well in between 6 and 16 weeks. You should clean the outside of the piercing twice daily with saline solution and rinse your mouth twice daily with a mouthwash specifically designed for oral piercings. I also suggest rinsing after eating and after drinking anything other than water. Until the piercing is healed, avoid smoking as this can inhibit healing. You should also avoid swimming, oral sexual contact and submerging the piercing in water – these will introduce bacteria to the piercing. You may find it helpful to drink with a straw, as this will keep your drinks away from the piercing. 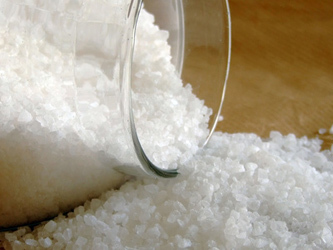 Once your monroe piercing has healed, simply clean with saline as needed. Try to keep make up away from the piercing. You should also keep an eye on any changes to the piercing or your mouth, as detailed below. Like all lip piercings, monroe piercings carry a risk of oral damage. This can occur if the jewellery rubs on your teeth and gums, leading to gum recession or tooth erosion. The main concern with a monroe piercing is gum recession, which can be irreversible. You can greatly reduce the risk of gum recession by wearing a BioFlex labret stud. BioFlex is a soft bio-plastic that is much gentler on your mouth, and you can still wear a metal ball so it looks the same as regular monroe jewellery. If you do notice any changes to the piercing site or the area of gum under your piercing, please consult a professional piercer immediately. They will be able to advise you on the extent of the damage and what to do next. 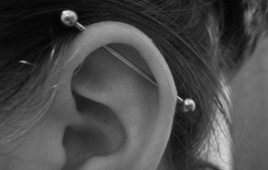 In extreme cases you may have to retire the piercing, but wearing correct jewellery from the start should prevent this. This entry was posted in Body Piercing Aftercare, Body Piercing Education, Labret Piercings and tagged Body Piercing Care, How To Care For Body Piercings, Lip Piercing Aftercare, Madonna Piercing, Madonna Piercing Aftercare, Monroe Piercing, Piercing Aftercare, Top Lip Piercing on June 18, 2013 by Piercing Guru. Medusa piercings are a great alternative to a standard lip piercing, but have a very similar healing process and care needs. This makes them ideal if you like the idea of a lip piercing, but fancy something a little different. Medusa piercings are pierced through the centre of the top lip and the jewellery is always a labret stud. They are also known as philtrum piercings, due to their placement. Medusa piercings are essentially the same as a traditional labret piercing, apart from their placement on the top lip. Like a labret piercing, medusas typically heal in six to fourteen weeks. As with other lip piercings, medusa piercings carry a risk of tooth and gum erosion, caused by the rubbing of the jewellery on your teeth and gums. This damage can be prevented by choosing a soft-backed BioFlex labret stud. There is also an element of luck – some people never experience any oral damage, while others are forced to retire their medusa piercing despite wearing suitable jewellery. I recommend wearing a BioFlex labret and checking the piercing site regularly. If you notice any changes to the area, especially gum recession, consult a professional piercer immediately – any damage will only get worse. A good piercer should be able to advise you on how serious the damage is and how to proceed. As a lip piercing, your medusa piercing needs two types of piercing aftercare. Firstly, you should clean the outside of the piercing twice daily with saline solution. Secondly, you should rinse with a suitable mouthwash – rinse twice daily and after eating or drinking anything other than water. Continue both these actions until your piercing has healed completely. While your medusa piercing is healing, you should avoid swimming and kissing, as these both introduce bacteria to the piercing. I also recommend avoiding alcohol and smoking, as they can inhibit the healing process. You may also find it helpful to drink through a straw. Once your medusa piercing is healed, it requires very little care. Simply keep it clean and monitor the piercing for any changes or unusual pain – consult a piercer immediately if you experience either. This entry was posted in Body Piercing Aftercare, Body Piercing Education and tagged Body Piercing Care, How To Care For Body Piercings, Lip Piercing Aftercare, Medusa Piercing, Medusa Piercing Aftercare, Medusa Piercings, Piercing Aftercare on June 5, 2013 by Piercing Guru.